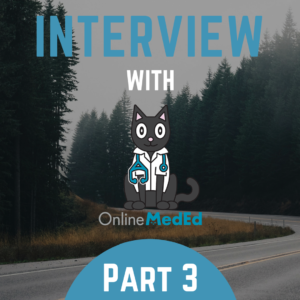 See my original review of OnlineMedEd’s free videos here: Resource Review, the first part of this series where I interview Jamie & Dustyn about their philosophy and part two where we discuss why their videos work for students. Although all the videos are 100% free, all paid subscriptions come with access to .PDF notes for every video, clinical cases, questions, audio download, flashcards and soon app access, too. What feedback have you gotten on how each feature helps students? What prompted you to create these additional tools? We know everybody learns differently. Some like to watch videos, others prefer to read, everyone should be doing questions, and flashcards are handy for utilizing in short bursts. We created a blended learning method that, when used fully, works. But we also offer versatility for the adept student who wants to do their own thing. It’s clear how you’re supposed to use the course (read, watch, questions, and then reinforce with flashcards and QuickTables), but it can easily be adapted to any learner’s style. That level of customization is unique and ensures virtually 100% of students can get something out of the program. With the .PDF notes, your guide recommends using them as a preview before each video. Have you gotten any feedback on other ways students use the notes? 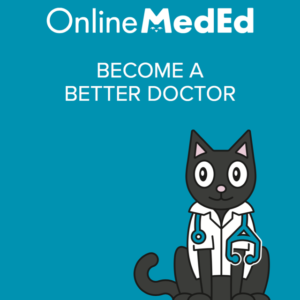 How do you recommend students use use OnlineMedEd? With such a variety of resources available we found ourselves regularly answering the same question – “How to use” – which is why we came up with a single recommendation. We know many students are using them to drill in video concepts or to review on downtime as well. Ultimately, it’s about what works for you. Versatility for learning preferences is key. [However, it’s] worth mentioning: when people struggle, we insist they strictly use our recommended method. Failing students suddenly begin to succeed with it. So while a student can pick and choose what they use, it’s the combination of notes-videos-questions-cards that promotes the most understanding and retention. So, how do the clinical vignettes play into the ‘How to Use OnlineMedEd’ philosophy? The cases are designed for people who really want to take it to the next level. They started off as “cases of the week” to keep people engaged in the site. But where they’ve gone is to model the “flipped classroom.” The cases are hard; they require going beyond the videos/course to get the answers right. They engage real questions that don’t have clear answers. They’re not about test prep; they’re about learning how to learn, weighing different options, and getting a little feedback from someone who has done it before. They’re there for people who like that style of learning and for our case-based didactics in the complete flipped classroom at universities. I highly recommend you go and create a free account now, whether you’re a third or fourth year medical student. Be sure to check out the “Dashboard” page, which will direct you to the “Shelf & Step Guide” as well as two month, three month and full year versions of their recommended study schedules. Be sure to check out their site if you’re a soon-to-be third year who wants to do great on wards and shelf exams, or a fourth year with time before Step 2 / Level 2. And remember, early this summer OnlineMedEd are planning to roll out a new iOS flashcard app to supplement their 100% free clinical education videos! Disclaimer: FMS gets no cash, prizes or perks for this interview series – I just want you guys to do awesome on exams and on the floor. Check back next week for part four of our chat! 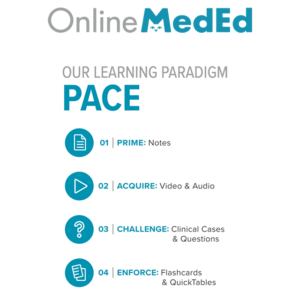 How to Use OnlineMedEd’s FREE clinical education VIDEOS! ← The Future of MedEd?